How to Ship Large Items across the Country? Fine Art Shippers is a team of dedicated shippers of fine art, operating across the United States and internationally. However, it does not mean that we ship only art, antiques, and other valuables. While we are indeed experts in the art logistics area, the truth is that in addition to packing and shipping paintings, sculptures, and other artworks, we are also proficient in transporting all kinds of oversized and heavy objects. So if you do not know how to ship large items across the country, Fine Art Shippers is the answer to all of your questions! sea transportation for very large and heavy items. It is also important to note that at Fine Art Shippers, we not only know how to ship large items across the country and internationally, but we can also do it for you at a very reasonable price. In fact, you will hardly find another high-quality large item shipping service available at a more affordable price than the one we can offer you at Fine Art Shippers. If you have any doubts, please do not hesitate to request a free shipping quote for your cargo today! We will be happy to provide you with the best offer possible! Now that you know how to ship large items across the country and where to find professional yet affordable help, let us draw your attention to one more essential part of our national and international shipping services. 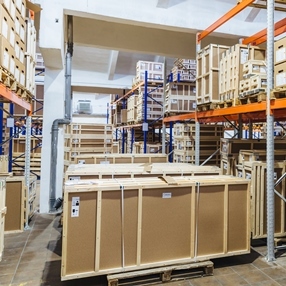 In addition to the very process of transportation, we also offer an extensive range of other services, including cargo packing, crating, long-term and temporary storage, white glove delivery, and insurance. In other words, whatever help and assistance you need, Fine Art Shippers is always at your disposal!